We all know that children need good role models. But do we ever stop growing up? I think adults also need older friends to look up to and think “That’s how I want to be when I’m that age”. Such friends are a rare commodity and to be treasured. When I married and moved to Canberra I left my friends and family in Europe. Fortunately a lovely lady called Joan Tyrrel, thirty years my senior, took me under her wing. She became my surrogate mother, friend and confidante. As our family grew Joan and her husband John became an extra set of grandparents for our kids and godparents to our daughter. John had taught Matthew English at Canberra Grammar School where he was also the Chaplin for many years. The Tyrrels had three married children of their own and grandchildren. But they had enough love to go around and we were the fortunate beneficiaries. When I rang and asked if it was okay to call in for coffee or lunch Joan never said sorry I’m busy, or it’s not convenient. She led a very full life – one of the secrets to longevity – but she always had time for me. Our shared love of cooking meant we often talked about food and swapped recipes, home grown vegetables, jars of home-made jam and chutney. People of all ages enjoyed Joan’s company because she was interested in what they were doing. 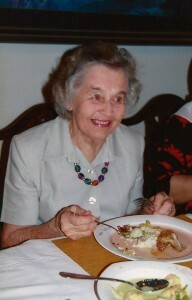 With such a positive and vibrant personality, she never seemed old. I remember once asking John how he was. “I’m very well thank you” he replied, “Joan says I’m not allowed to say anything else”. We all laughed, but it was so like her. Having grown up during the War Joan hated waste. When she switched on her dishwasher there wasn’t room for another spoon or fork. And she always cut the Finish tablets in half, swearing that half did just as good a job as a whole one. 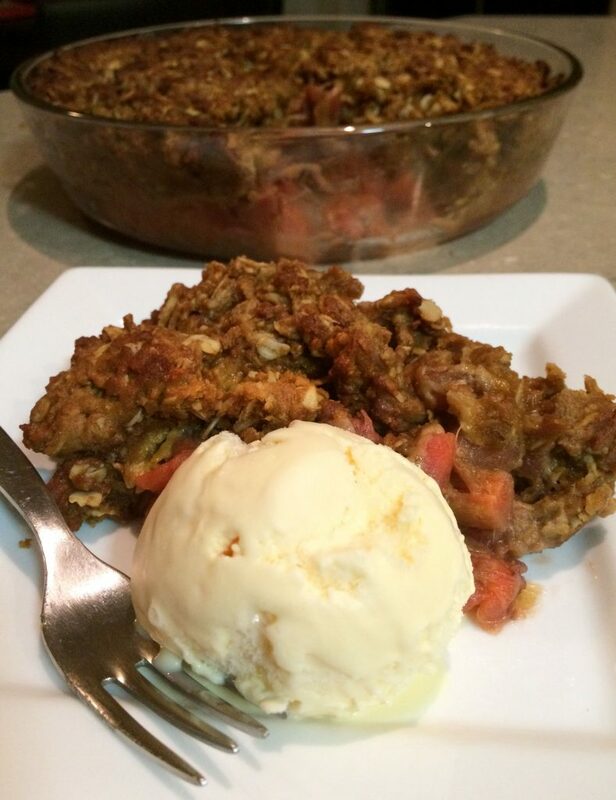 Joan’s recipe for a quick and delicious apple crumble is different because she always left the skin on the apples and melted the butter for the topping. Preheat oven to 180°C. Core and slice apples and arrange in a buttered pie dish or in 6 individual ramekins. Sprinkle with sugar. Melt butter, add sugar and cinnamon. Lastly add flour and crumble between fingers. Sprinkle over the apples, then bake at for 30-40 minutes, or until golden brown and bubbly. 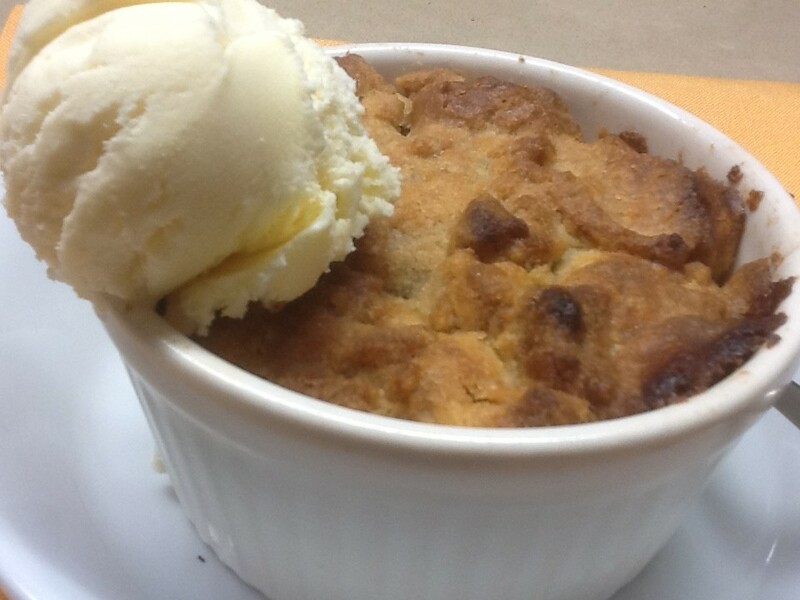 Serve with cream or vanilla ice cream. Once cooked the individual apple crumbles will keep in the fridge for 5-6 days, covered. Just zap in the microwave for a minute, top with some ice cream and serve for an instant mid-week dessert. When I worked for the British Mission to the UN in Geneva, located on the 5th floor of a large building on the Rue de Vermont, there was a patisserie at street level. 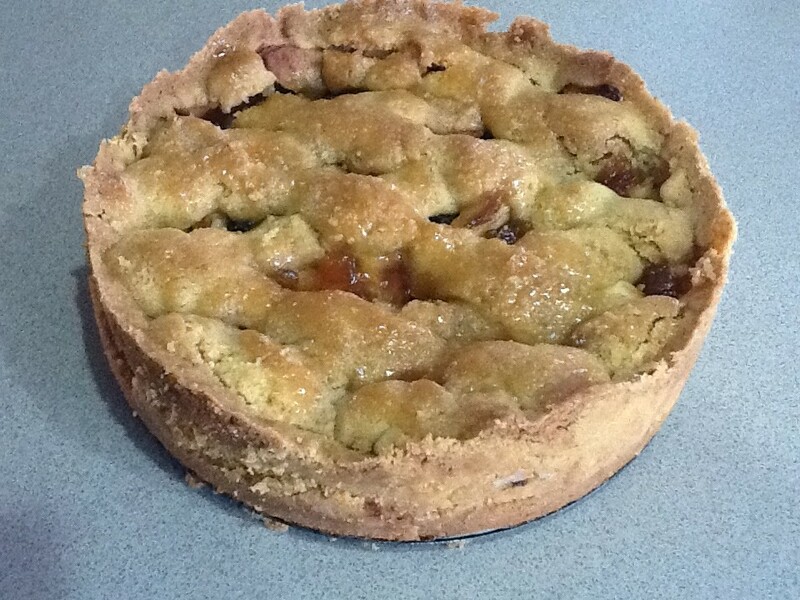 By mid-morning irresistible smells came wafting up through the office window, so someone was dispatched to buy a few slices of apple tart, still warm from the oven, to keep us going till lunch time. Those were the days when I could do that on a regular basis, without it going straight to my hips! Before I left Switzerland I asked the owner if she would part with the recipe and she was happy to do so. Puff pastry is a bit of a pain to make, so I usually buy it. That is until I discovered Nigella Lawson’s food processor version which is a cinch to make and of course much nicer. Actually any pastry will do and you may prefer to use shortcrust pastry, bought or home-made. Pastry: place flour, salt and butter in food processor. Pulse until butter has been cut into small pieces but is still visible. With the motor running add the lemon juice and enough water for the pastry to start to stick together, then stop immediately. Don’t process for long because you want to keep the pieces of butter intact. Tip out the sticky crumbs and with floured hands form them into a neat rectangle about 15 cm long and about half as wide. Wrap in plastic wrap and refrigerate 30 mins. Remove from fridge and roll pastry until the long side is twice as long. Fold one end into the middle and the other end over it to the edge, like an envelope. Turn pastry so the open ends are at the bottom and top, then roll again into a long rectangle. Repeat the folding and rolling twice, but the last time don’t do the final rolling – leave it with the open ends. Wrap in plastic wrap and refrigerate several hours or up to three days. Can be frozen. Preheat oven to 180°C. Remove pastry from fridge and, unless you’re working on a hot summer’s day, let it stand for a short while, so it’s not rock hard. Roll out on a floured surface and use to line a rectangular metal Swiss roll or slice tin, trimming off any excess. Mine is 35x25cm. Arrange rows of overlapping apple slices over the base. 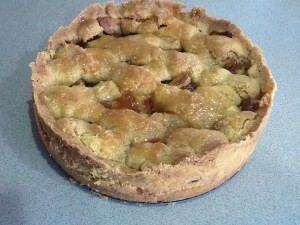 Be generous – the pie should be very full with the apple slices standing almost upright. In a small bowl with a fork or balloon whisk, mix egg with flour (or almond meal) and sugar, then gradually mix in milk/cream. Brush over the apples to moisten them, then pour the rest over. Tilt tin to ensure it reaches the corners, then dot the apples with very small pieces of butter and sprinkle lightly with extra sugar. Bake for about an hour or until well browned, almost burnt in places, to give it that authentic European patisserie look. If liked shake over some extra sugar and serve warm, just as it is, or with cream or ice cream, or both! I recently spent three days in hospital for a knee operation. Hospital food as a general rule is nothing to write home about, but I have to say that my stay in the Canberra Specialist Surgical Centre was a pleasant surprise in that regard. The food was well above average and to be honest everything else (apart from no wifi!) was also fantastic. Lovely staff who arrive within a minute of patients pressing the buzzer, great views, comfortable rooms. One exception on the food front was the Dutch Apple Pie. When you’re incarcerated, bored and in pain food takes on a whole new meaning. Each day I was given a form to choose what I wanted to eat the next day, so when I saw Dutch Apple Pie I thought “yum” and ticked the box. Unfortunately when it arrived it was very disappointing and not remotely related to the real thing. Just a shortbread covered with apple puree and topped with pale crumbs. 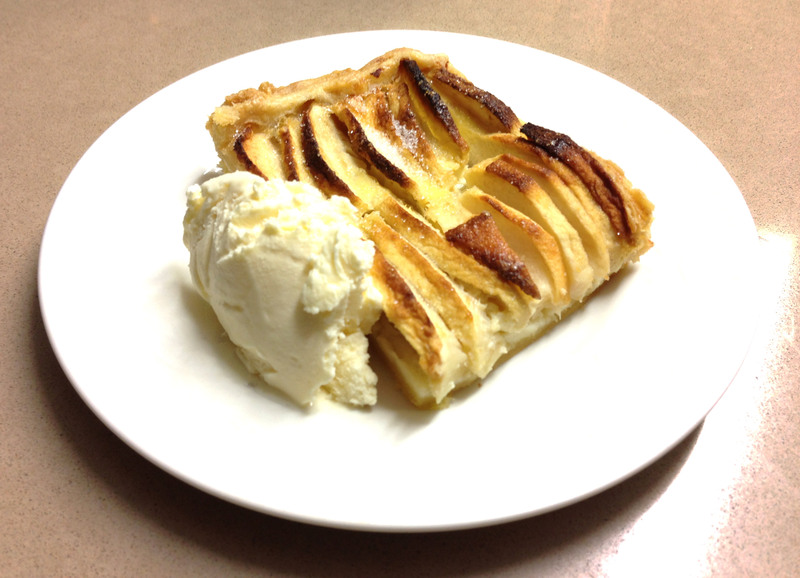 Many years ago my Dutch friend Kien gave me her recipe for Dutch Apple Pie and here it is. The real McCoy. Soak dried fruit in rum. Pre-heat oven to 160C. Mix butter and sugar until light and fluffy in food processor or with electric beaters. Mix in flour until well mixed and sticking together. Tip out, form into a fat log and refrigerate for about 30 mins wrapped in plastic wrap. Cut log into three. Cut off slices and use to press all over the bottom of a buttered 30 cm spring-form pan. Bake for 20-30 mins till golden then cool. Filling: Turn oven up to 170°C. Mix apples with sugar and cinnamon. Line sides of cake tin with another third of the shortbread. It’s difficult to roll out so the easiest way is to cut off thin slices and press them onto the sides of the tin like a jigsaw puzzle. Drain dried fruit (keep rum), mix with apples and put into tin. Use remaining shortbread to make strips and form a lattice to cover apples. Pinch edges of the lattice onto the sides of the pie so it all joins up. Bake for 1¼ hours. Spoon rum through holes between the lattice. Paint lattice with heated and sieved apricot jam, using a pastry brush, which gives a nice glaze. Cool thoroughly before removing sides of tin. Serve with whipped cream or pouring cream. Peek celebrations are all about the food and those in the know rarely turn down an invitation to one of our gatherings. A Dutch friend once told me that when Dutch people have guests coming they clean the windows. My mother arranges flowers everywhere, while others spend hours cleaning and dusting. I cook and so do our three offspring. If it’s a choice between doing a quick gallop round with the vacuum cleaner before people arrive, or whipping up some mayonnaise to go with the prawns, the mayo will win every time. Last Saturday our son James organised an afternoon tea party to celebrate his wife Karen’s 40th and their second son Luke’s 3rd birthday. There were about 20 adults and umpteen kids coming, so I offered to make a couple of apple strudels and some egg, mayonnaise and chive sandwiches which always go down well with kids of all ages. Home-made mayonnaise is the secret. James made some delicious morsels, including sausage rolls and mini yorkshire puddings with smoked trout pate. When I was growing up in England my mother only had two cookbooks. One was published by the makers of Stork margarine and contained basic recipes for the cakes and pies a British housewife needed in her repertoire. It was my Mum’s bible in the early days of her marriage and she gave me an updated version when I got married and moved to Australia. I still have it somewhere amongst my many cookbooks. The other was called International Cooking and it had a chapter from several European countries. 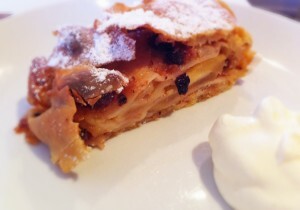 When I was about twelve I made the Austrian Apple Strudel. It was a huge success and I’ve been making it ever since. You can use fillo pastry instead of making your own dough, but it’s not really hard to make. When I get time I will make a video showing how to roll and stretch the dough until you can almost read a newspaper through it. Dough: Place all ingredients except water in food processor and mix, then add enough tepid water slowly through the top with the motor running, until it forms a ball. It should be soft but not sticky. Stop the motor when it has started to form a ball. Gather all the bits together and knead for a few seconds to make a smooth ball then place in an oiled bowl and turn to coat with oil. Cover with a tea towel. Filling: fry breadcrumbs until golden brown in 60g butter, turning, till they look like toasted muesli. Mix with remaining ingredients. Sprinkle a little extra flour over a clean tea towel and roll dough out as large as possible without tearing using a rolling pin. Then continue to stretch gently with your hands until you have an oblong about the size of the tea towel and the length of your baking tray. Spread with apple filling, leaving about 2.5 cm all round. If you like you can cut the slightly thicker edges off, but I like to fold them in onto the apples. It makes the ends of the strudel a bit thick and doughy, but it ends up crunchy and for some people that’s their favourite bit! Roll up using the tea towel to assist, with the long end underneath. Tuck the short ends under and pinch to seal. Place on a buttered baking sheet and brush with some of the extra butter. Bake 20 minutes at 220°C, then 30 minutes or so at 180°C, brushing from time to time with melted butter. When golden brown remove and cool for 10 mins, then carefully remove with spatulas to a cake rack. You will need two people with a spatula in each hand. Serve warm or at room temperature, dusted with sifted icing sugar and accompanied by whipped cream. 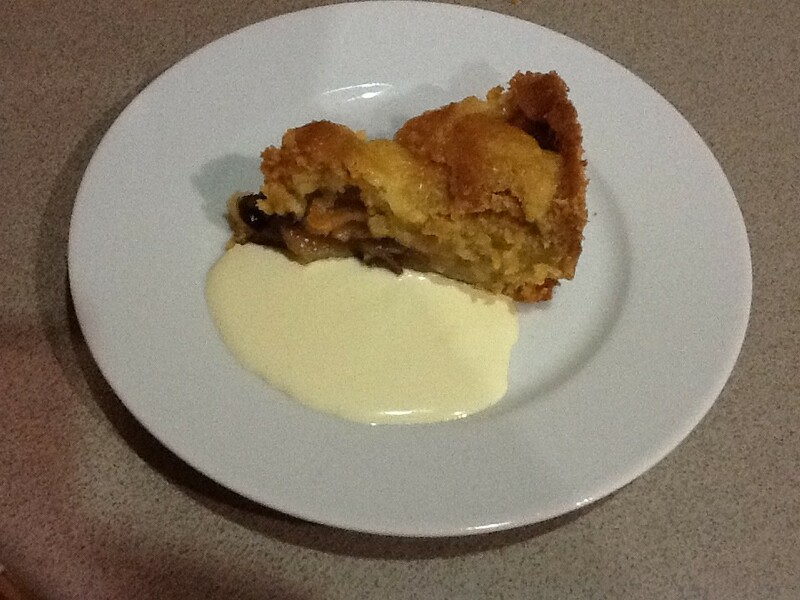 Note: It’s nicer and more authentic using home made pastry. If using fillo pastry, stack 10 sheets, brushing each one liberally with melted, unsalted butter. Place filling along one long edge rather than spreading it all over. Roll up and proceed as above.